Good news! 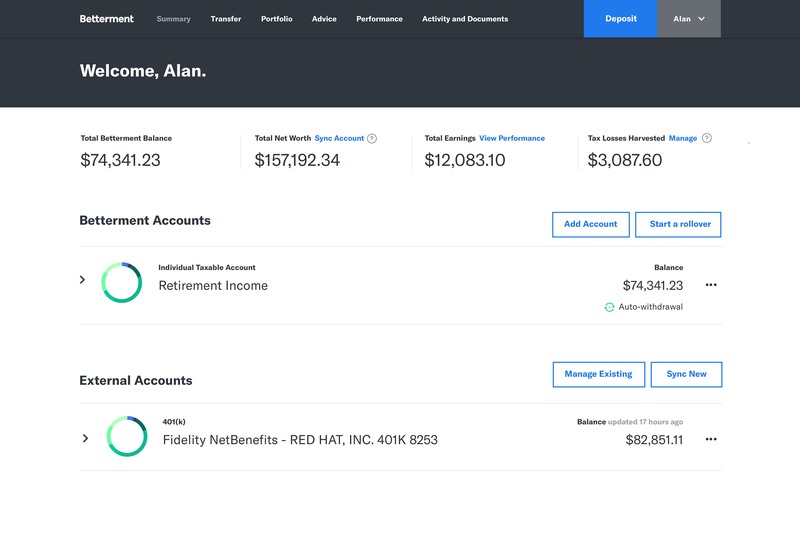 Betterment supports Roth IRA accounts! Check them out here. Betterment builds you a customized and efficient portfolio comprised of widely diversified, low cost ETFs. It's easy to use, even if you're new to investing, but it also has a robust feature set to satisfy more advanced investors. 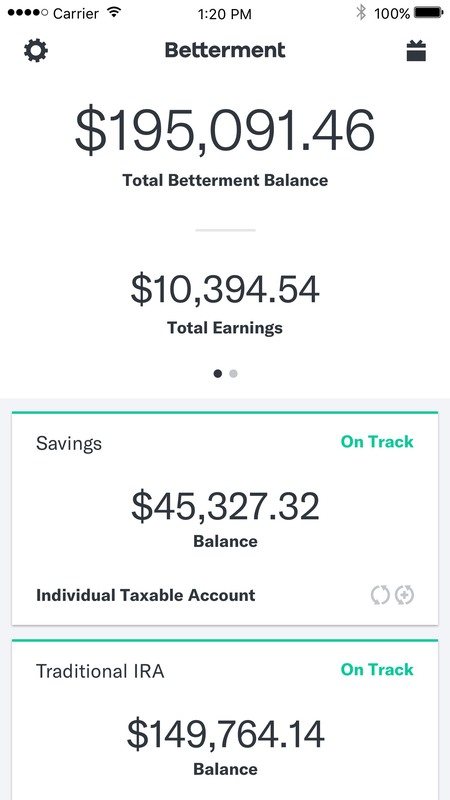 If you don't want to manage your own portfolio for automatic rebalance or hire a financial advisor, Betterment is tough to beat for the very low price especially for smaller accounts. 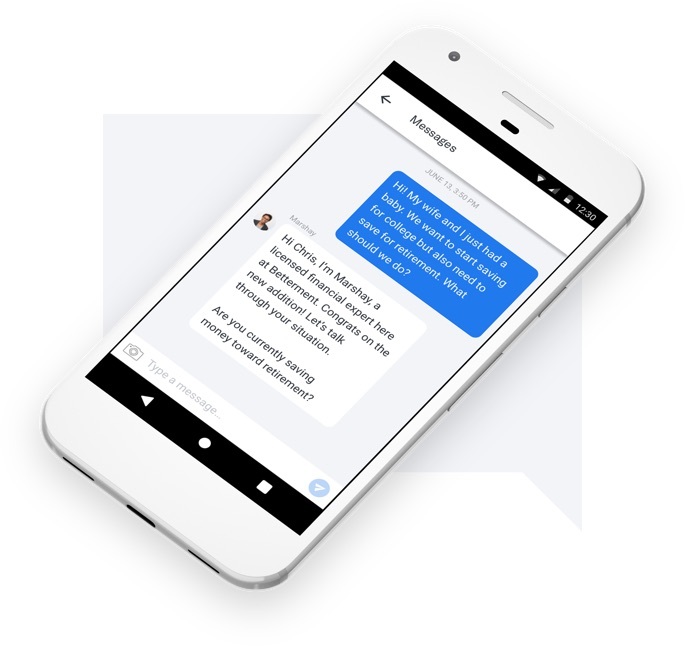 In addition, you'll have access to Betterment's team of financial advisors through secure text messaging on their mobile app, so you can ask any questions you want and get a quick response from a real live human. If you sign up through InvestmentZen, you'll get a free month when you make an initial deposit of $10,000 or more up to 1 year free depending on initial deposit amount! Get up to a year of free investment management with this limited time offer from Betterment. 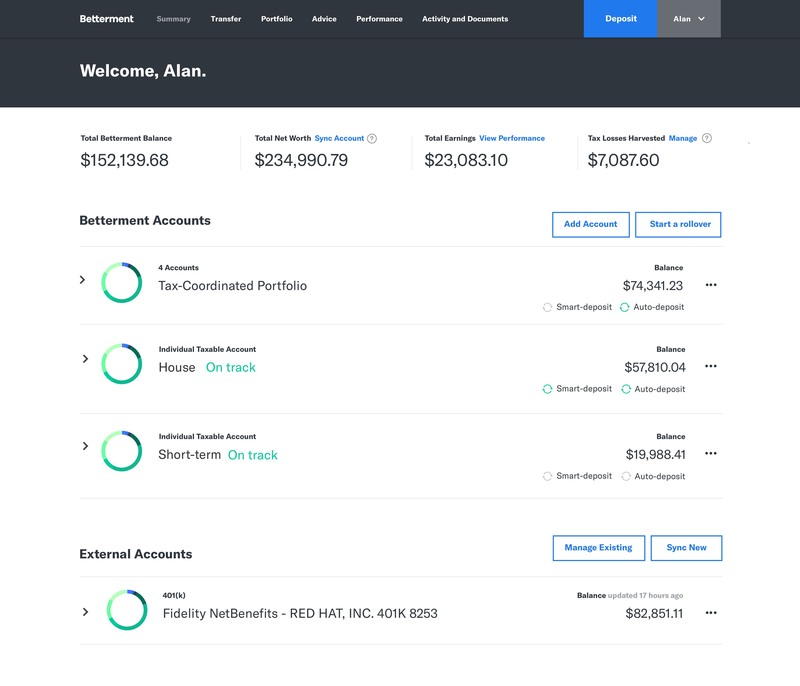 Betterment is an automatic investment firm that boasts some of the lowest fees in the industry (including up to 1 year for free when you sign up through this link) and makes life easier by giving you the ability to automatically rebalance your portfolio without exorbitant payments to financial advisors, yet also more control than a target retirement fund like Vanguard which makes all the decisions for you. These images are illustrative only and may not be a current or full representation of an actual client experience. Betterment is a service known as a robo advisor. In other words, it’s an automated investing service. You tell them what your goals are, how much money you make, and how old you are. Once they have this information they create a strategy that works for you and invest your money accordingly. For example, if you're early on in your career, most of your money will be held in growth oriented stocks with a small percentage in bonds, and as you mature, your assets will slowly shift to more stable stocks and a greater percentage in bonds to help reduce volatility. Betterment Digital: Access to award-winning technology that helps automate investing with tax-efficient algorithms and digital advice, at a flat 0.25% fee. 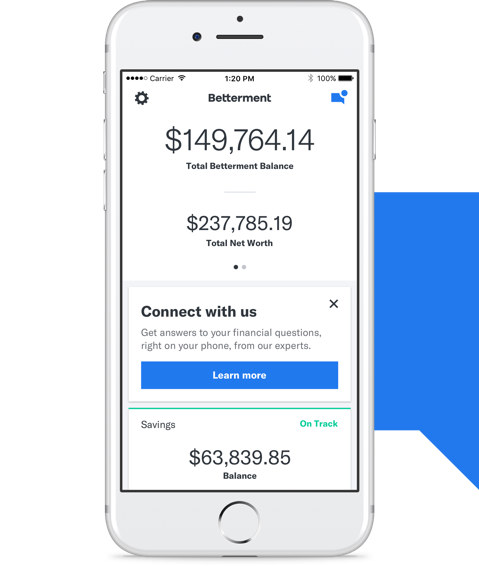 Betterment Premium: Get the Digital product with unlimited access to a team of certified financial planning professionals and licensed financial experts who monitor accounts and give advice and financial planning throughout the year, for a flat 0.40% ($100,000 minimum balance required). To get you started, Betterment is offering up to 1 year free with a $10k minimum deposit. 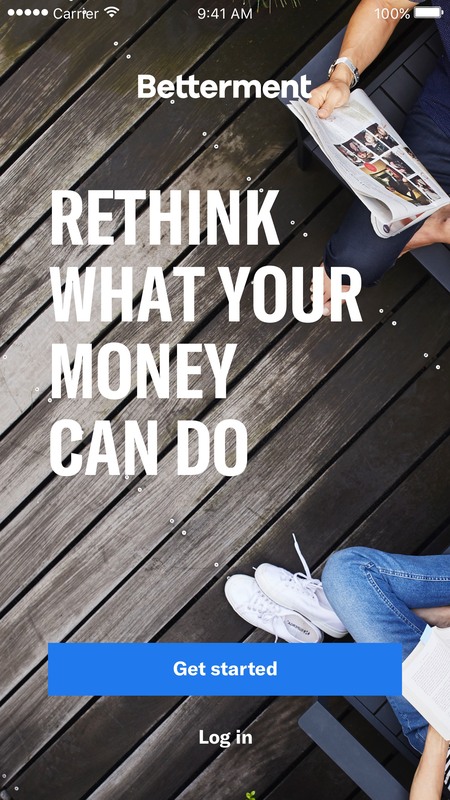 Getting started is easy and flexible; you can open a standard account or a tax advantaged account such as an IRA or Roth IRA, and you're able to move funds from an existing account to Betterment in less than a month. All you have to do is fill out a form online to authorize the funds transfer. They provide an intuitive interface to set up automatic deposits, a customized investment strategy based on your unique financial situation and preferences, along with the ability to automatically invest extra funds from your checking account within minutes. You can begin the sign up process here to see for yourself. It's very quick and painless, even (especially!) if it's your first time doing any kind of investing. One of the reasons it’s so hard for young people to invest is because few people want to take us on as a client. You know how the saying goes - "you need money to make money". One of the great things about Betterment is that you get access to services that would have otherwise been impossible for young or beginning investors to get their hands on. For example, the custom asset allocation functionality that Betterment offers was traditionally only provided by financial advisors who would charge you a hefty fee. You can further ask questions to Betterment's licensed financial experts by contacting them via Betterment's mobile app. They can help you with setting savings goals (e.g., buying a house) or choosing risk levels, amounts to invest, and types of accounts. 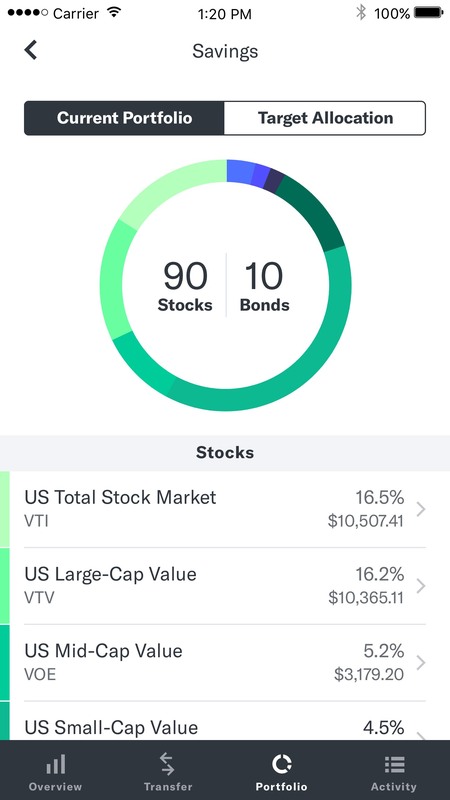 Standard Betterment ETF portfolio: tried and true diversified equities portfolio. Socially Responsible Investing (SRI) portfolio: tailored for those who want to align their values with their investments, this portfolio favors investing in companies that meet or exceed criteria involving environmental, social, and governance impact. Blackrock Target Income portfolio: designed for those in retirement or seeking a low-risk alternative, this is a 100% bond portfolio with different income targets that seeks to provide steady income with low risk. Goldman Sachs Smart Beta portfolio: best suited for long-term goals, this portfolio follows multiple rules-based investment strategies that select stocks and bonds with the goal of outperforming a traditional market index. Betterment also helps you figure out and reduce your taxes through two features: one is Tax Coordinated Portfolios and the other is Tax Loss Harvesting. Tax Loss Harvesting is a practice where investors sell off a security that has experienced a loss in order to get a tax write-off, which can make a significant difference in your investment returns. You'll also get the benefit of Tax Loss Harvesting across multiple accounts for spouses. If you enable TLH on your Betterment account, you'll be asked for your spouses’ Betterment account information so that they can help optimize your investments across you and your spouse's accounts and help prevent wash sales. Tax Coordinated Portfolios on the other hand places assets that will be taxed highly into your IRAs which have big tax breaks, while placing assets that have lower taxes in your standard taxable accounts. This strategy can boost after-tax returns by an average of 0.48% per year which adds up to an impressive ~15% savings over 30 years. Of course, these benefits were also once just the domain of the filthy rich, but now all Betterment users have access to it automatically! Tax Loss Harvesting and Tax Coordinated Portfolios are also available in combination with Betterment's Socially Responsible Investing Portfolio. This portfolio enables you to invest in low-cost funds oriented toward investment products that meet environmental, social, and governmental criteria without sacrificing the things that protect investors’ returns the most: global diversification, tax optimization, and control of cost. 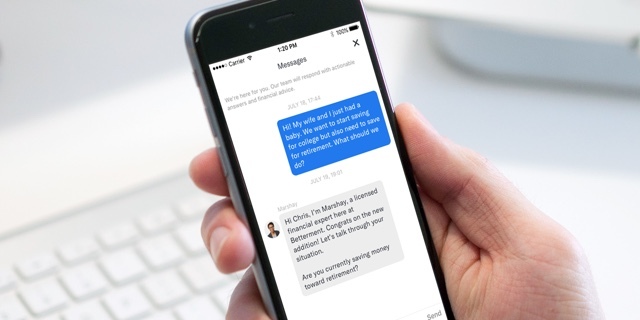 Finally, Betterment offers encrypted text messaging capabilities on their mobile app (both iOS and Android) that allows you to directly contact their team of financial advisors anytime. They guarantee that all responses are non-automated, i.e. from a real human being instead of a chat bot, so you can get your questions answered quickly and accurately. Like many people in the personal finance space, you're probably a fan of Vanguard funds for their profitability and low fees. But you may have encountered a problem where it wasn't always easy to meet the minimum deposits required to invest in some of the funds you want, which means that the end result was oftentimes that you'd have a portion of your money sitting in a money market fund instead of your desired ETF. With Betterment you're able to deposit into any sort of ETF or fund with whatever money you have available. You don't need to have $3,000 to $5,000 up front in order to invest in what you want. If all you have in a given month is an extra $20, you can still throw it into your Roth IRA without an issue. Plus, Betterment and Vanguard share a similar philosophy and investment strategy, so you know you'll still get many of the same benefits. This image is illustrative only and may not be a current representation or fully representative of an actual client experience. So just how much does it cost to use Betterment? Betterment boasts some of the lowest fees in the industry and they are extremely straightforward at just a flat 0.25% for all assets managed. Betterment's low management fee includes all rebalancing, transaction and trade fees; these are all things that might be killing your target date fund returns. The answer is an emphatic YES on both fronts. In fact, they are even getting approval from well-known financial institutions. In 2014, Betterment and Fidelity joined forces in an effort to connect registered investment advisors with the automated services Betterment provides. They're also partnering with Vanguard and Goldman Sachs to diversify their offerings. Uber has partnered with Betterment to provide retirement planning services for their drivers. Finally, Betterment now has over $5 billion in assets under management, so you're in good company! Betterment is a good place to start for young or beginning investors. It’s easy to use, has low fees and takes a lot of the guesswork out of investing. If you sign up through this link, you can get up to 1 year for free to start. Betterment is a strong option for fans of automated investing who are looking for customized portfolio allocation, hands-off rebalancing and innovative automatic deposit solutions. Investors with $100,000 or more will save money on management fees by choosing Betterment over the competition. Betterment will build you an efficient portfolio comprised of widely diversified, low cost ETFs. If you don't want to manage your own portfolio, or hire a financial advisor, Betterment is tough to beat for the very low price. What makes Betterment so unique from other brokerages is that you do not trade individual stocks or mutual funds, but you invest in a bucket of Exchange Traded Funds (ETFs) that are personalized to your specific goals. If you aren’t investing at all, consider Betterment. If you don’t have an IRA, consider Betterment. If you’re looking for a place to Rollover your 401K or existing IRA, consider Betterment. If you’re already doing passive investing with ETFs, compare your expenses with the fees Betterment has. Betterment really is a great company to work with. By providing ways to automate your investing, they have become a great start up investment for new investors that don’t have too much to work with. They give consumers the opportunity to invest very little and grow. However, if you’re a bigger investor, you may want to consider other options to avoid the added cost for automation that you don’t need. 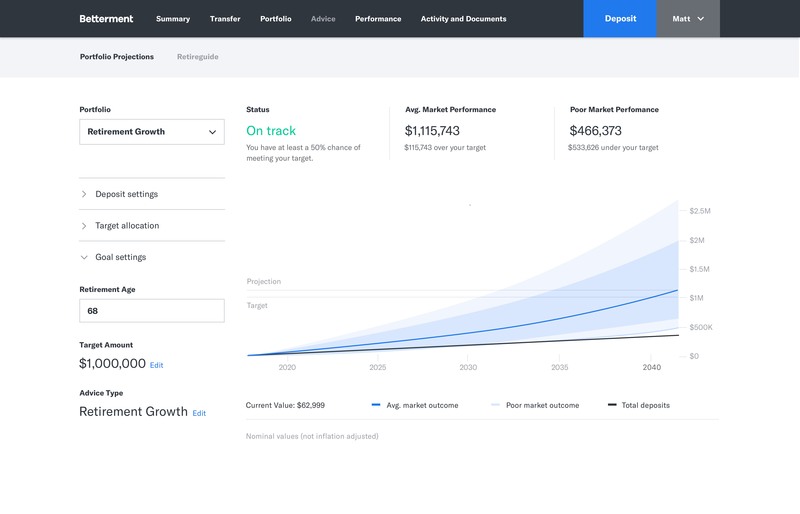 Betterment is a new investing platform that takes index investing and actually makes it simple. Betterment is a perfect starting point for young investors. They make investing easy for beginners by focusing on simple asset allocation, goal setting features, and low-cost portfolio management. Betterment is an excellent choice for investors by making investing easy - after the 10 minute set up process you never have to do anything again! This helps you focus on the long-term aspect of investing through automation.